Valentine’s Day is just over a week away and we have everything you need to make your day special. 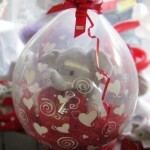 We have fabulous balloon bouquets to give or send to that special person in your life. Prices start from only £4.99 and we can also deliver your bouquet for only £2.95! And why not make your romantic valentine meal even more special with one of our spectacular table decorations? Prices start from only £4.99 for a three balloon table decoration. Looking for a great gift? What better way to show you care than to give someone one of our gorgeous Me to You bears or Elliot balloons! Order your balloons now to avoid disappointment! Cards & Fancy Dress & Balloons Etc have joined Twitter and now you can follow our tweets. Keep updated on our latest products in store and all our news. Valentine’s Day is fast approaching and here at Cards & Fancy Dress & Balloons Etc we are busy making preparations so that your day goes to plan. 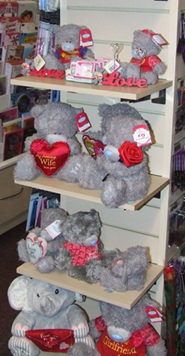 We have a fantastic range of cards with prices starting at only £1.29, amazing gifts including Tatty Teddies and Boofle mugs along with wrapping paper and gift bags. 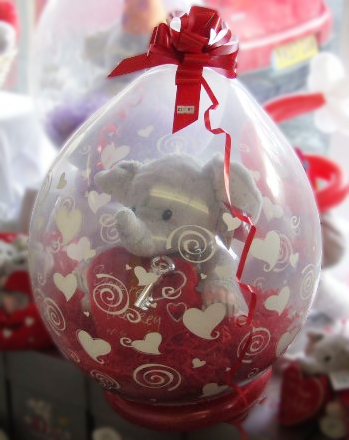 We also have some fabulous balloon displays and can deliver them for only £2.95. Please see in store for details.